You promise to pay us the principal amount of $4,995.00, plus a time price differential accruing on the unpaid balance at the rate of 20.95 % per year from today's date until maturity. The time price differential accrues on a 365 day basis. After maturity, or after you default and we demand payment, we will earn finance charges on the unpaid balance at 20.95 % per year. You agree to pay this Contract according to the payment schedule and late charge provisions shown in the TRUTH IN LENDING DISCLOSURES. You also agree to pay any additional amounts according to the terms and conditions of this Contract. SES Taurus. FFV so will run on flex fuel. All power features, power windows, door locks, mirrors, power brakes, power steering, fold down center console, leather, cd player, BIG TRUNK, alloy wheels, AND ALL THIS FOT $595 DOWN and $135 BIWEEKLY!!!!!!!! Call and get this baby before it finds a HOME!!!! 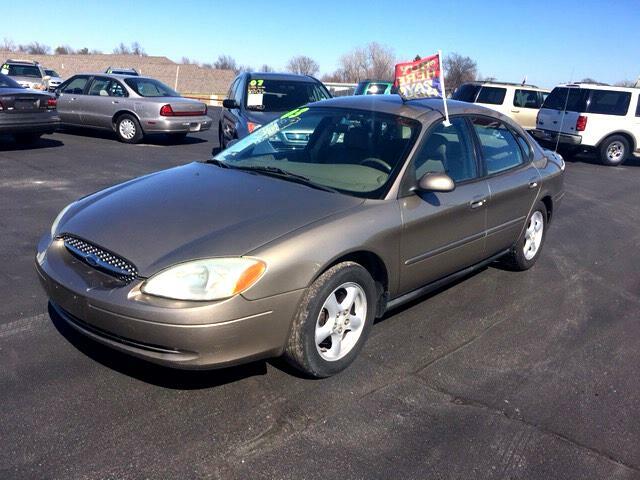 We are excited to offer this vehicle that has thoroughly been checked out by our service department. We offer most vehicles for sale, either by "buy here pay here" or conventional financing, but some vehicles are sold "CASH SALE," based on older year models or higher mileage vehicles. Check with our office to see what options are available on a particular vehicle. If the vehicle is available for "buy here pay here" then the down payment and biweekly payment and terms will be listed with the vehicle information, otherwise we have AGGRESSIVE finance options through over 20 finance companies that are tailor made for A plus to marginal credit. All our inventory is available for cash sales. We are located at 5729 East 11th Street (Old Route 66) in Tulsa, Oklahoma. Come by and take a closer look at the finest independent dealership in the Tulsa area. All our vehicles can have extended warranties available. All advertised prices exclude government fees and taxes, any finance charges, any dealer document preparation charge, and any emission testing charge. The price for listed vehicles as equipped does not include charges such as: License, Title, Registration Fees, State or Local Taxes, Dealer Prep, Smog Fees, Credit Investigation, Optional Credit Insurance, Physical Damage of Liability Insurance, or Delivery Fees. DEALER makes no representations, expressed or implied, to any actual or prospective purchaser or owner of this vehicle as to the existence, ownership, accuracy, description or condition of the listed vehicle's equipment, accessories, price, specials or any warranties. Any and all differences must be addressed prior to the sale of this vehicle. Your actual mileage will vary depending on how you drive and maintain your vehicle.